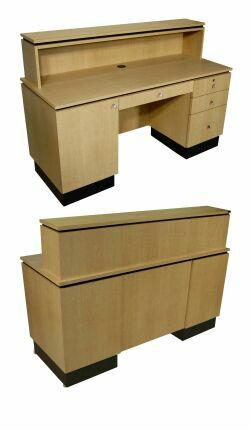 4417-60 NEO Gamma Reception Desk w/ modesty panel, locking cash drawer w/ cash till, utility drawer, file drawer, pencil drawer, storage cabinet, & bar-pulls. Left cabinet w/ wire-path for computer. NEO Delta Reception Desk - same as Gamma reception desk, except w/ pull-out keyboard tray in chairwell in place of pencil drawer. Both 60"W x 24"D x 42"H.
Choose from 8 popular QSE COLORS or custom order your color for an additional 10%. Pictured w/ standard 5 1/2" toe-kick base; cast aluminum legs are an available option.